TEAM AND DIRECTOR:From left: Daijon McHayle, Renée McHayle, Janet Krusmark (one of the Directors of Robin’s Nest Children’s Home) and Tyeanna Harvey pose for the camera after the presentations. 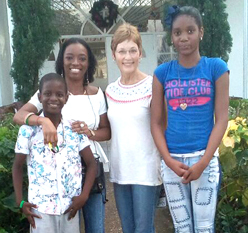 The Robin’s Nest Children’s Home recently benefitted from a presentation of clothing and gift items, courtesy of a foundation named Gift of Helps, led by St. James resident Renee McHayle. The facility, which is situated in Salter’s Hill, John’s Hall, St. James, received the items during the recent Christmas holidays as part of Gift of Helps campaign to reach out to the less fortunate. The team from Gift of Helps included Mrs. McHayle, her son Daijon McHayle and sister Tyeanna Harvey. After weeks of procuring the gift items and making arrangements with the directors of the Home, the Gift of Helps team presented a wide range of toys and pieces of clothing, among other items, to the residents there. “I really want to say a big thank you to all who donated their time and money to this venture. It was a great success and we could not have done it without you. Special thanks to Lorraine and Trudy from the Western Mirror and also Kayon. God bless and keep you all in the coming year(s),” an enthusiastic Mrs. McHayle expressed. Janet Krusmark, one of the Directors of the Robin’s Nest Children’s Home, who was on hand to participate in the presentation, expressed sincere appreciation to the team from the Gift of Helps Foundation. The Robin’s Nest Children’s Home caters to 35 children currently between the ages of one to 12 years old. Gift of Helps Foundation, a small charity organization, has been assisting children’s homes as well as the Poor Relief Department of the St. James Municipal Corporation for several years. “The Foundation aims to assist persons and organizations which are most needy. The work of the foundation is inspired by God to help those in need,” Mrs. McHayle informed. According to Mrs. McHayle, the next project will be to feed and clothe children living on the streets of Montego Bay.